The Valmetal Hay Bale Distributor can be adapted to almost any barn configuration and run on any type of existing track. Suspended from an overhead track, the Valmetal Alfred moves back and forth, slowly and quietly, leaving plenty of time for the cows to help themselves. Versatile, it can handle all sorts of hay bales, round or square, big or small. A whole line of attachments are available to fit your needs. 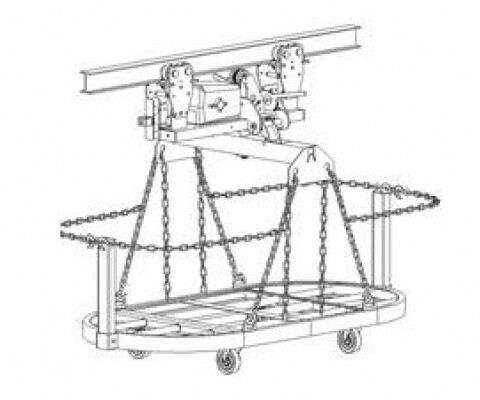 This rail distributor model is used to raise, carry and unroll round hay bales. The operator must push the unit to advance and unroll. Only the hoist is motorized and must be connected to 110 volts to run! 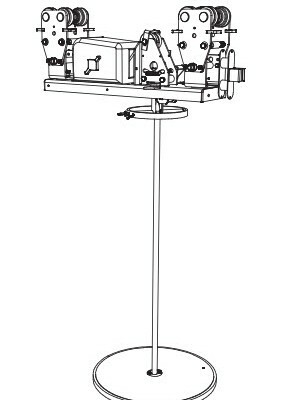 It includes a 24 “dish” ” and is available with either a regular hoist (1200 lbs) or a Cyclair hoist (3000 lbs). Available on “I” rail and round rail! This rail distributor model is used to raise and carry square hay bales. The operator must push the unit to advance and unroll. 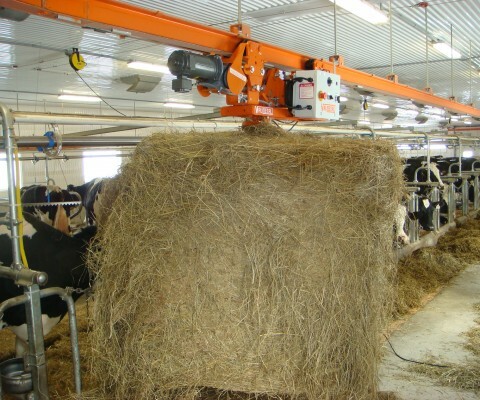 Only the hoist is motorized and must be connected to 110 volts to run! 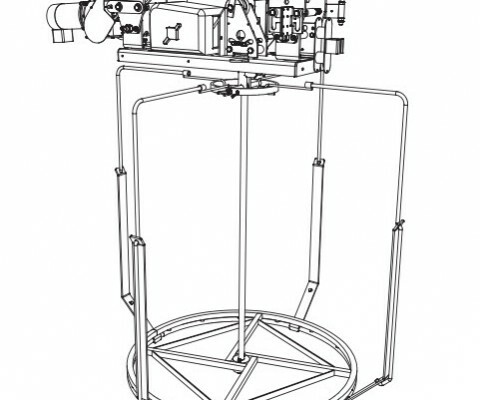 It includes a 24 “dish” ” and is available with either a regular hoist (1200 lbs) or a Cyclair hoist (3000 lbs). 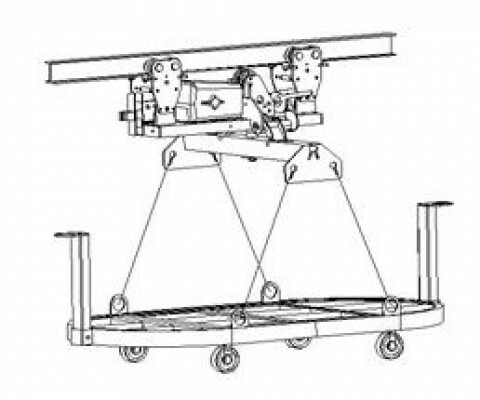 This rail distributor model features a hoist and a motorized trolley. The operator cotrols the motors manually with a remote. The systen must be powered by 110 volts with conductor bars. 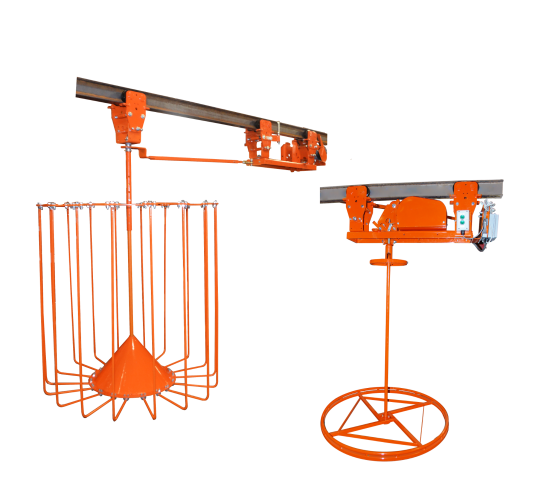 It includes a 24 “dish” ” and is available with either a regular hoist (1200 lbs) or a Cyclair hoist (3000 lbs). This rail distributor model is used as a motorized serving tray for round bales of hay. The feeder travels automatically back and forth between two set points without interruption. Manual start and stop by operator. The system must be powered by 110 volts with conductors bars. It includes a 40” dish, hooks, arms and straps. 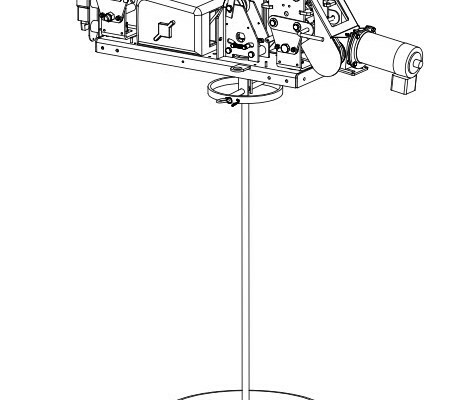 This rail distributor model is used as a motorized serving tray for square bales of hay. The feeder travels automatically back and forth between two set points without interruption. Manual start and stop by operator. The system must be powered by 110 volts with conductors bars. It includes a 40” dish, hooks, arms and straps. 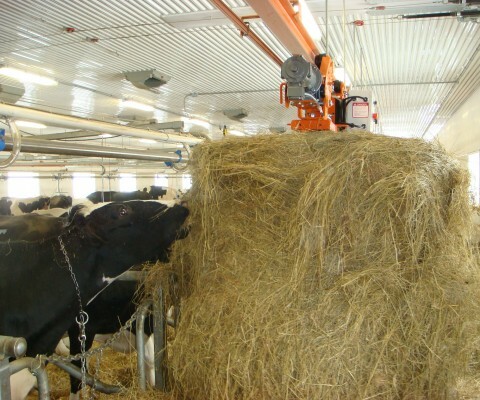 The automatic feeder starts, feeds and stops automatically at preset times. Capacity of 4 groups and six parkings. The system must be powered by 110 volts with conductor bars. It can switch rails for a different course.